A Southern Star John Edwards Production. Network Ten. 2010. Created by: Debra Oswald with John Edwards and Imogen Banks. Executive Producers: Rick Maier, Rory Callaghan. Producer: Imogen Banks, John Edwards. Director: Kate Dennis. CD (ST)	Level Two Music. 0886977606120. 2010. 01: Thao With The Get Down Stay Down - When We Swam. 02: Dan Kelly - Hold On, I'm Coming On. 03: Andy Bull - Nothing To Lose. 04: Hot Chip - Wrestlers. 05: LCD Sound System - Drunk Girls. 06: Flight Facilities - Crave You. 07: Sia - Clap Your Hands. 08: World's End Press - West End Girls. 09: Freelance Whales - Hannah. 10: The Jezabels - Hurt Me. 11: Angus & Julia Stone - Hold On. 12: Lisa Mitchell - Running Through The Forest. 13: Fatty Gets A Stylist - Let Me Fade. 14: Magic Silver White - Knew That I Loved You. 15: Kate Vigo - The Way You Are. 16: Eagle And The Worm - All I Know. 17: Xavier Rudd - Love Comes And Goes. 18: Eddie Perfect - Break Your Fall (Bonus Track). CD (ST)	Sony Music. 0886979402423. 2011. 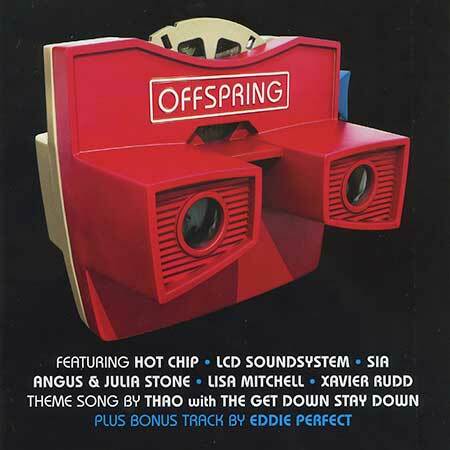 “OFFSPRING MUSIC FROM THE HIT SHOW VOLUME 2”. 01: Gypsy & The Cat -Time to Wander. 02: Tim & Jean - Come Around. 03: The Naked & Famous - Punching In A Dream. 04: Diafrix ft Daniel Merriweather - Simple Man. 05: The Black Keys - Tighten Up. 06: El Guincho – Bombay. 07: Magic Silver White – Doowah. 08: Lykke Li - Get Some. 10: John Butler Trio - Don't Wanna See Your Face. 11: Guineafowl - In Our Circles. 12: Best Coast - Crazy For You. 13: Cat Call - Swimming Pool (Cloud Control Remix). 14: Worlds End Press - Only The Brave. 15: The Bamboos - Never Be The Girl. 16: Big Scary - Falling Away (Jacques Renault Remix). 17: Winterpark - Never Alone. 18: ASA – Questions. Thao - When We Swam. CD (ST)	Sony Music. 88725426922. 2012. "OFFSPRING MUSIC FROM THE HIT SHOW VOLUME 3". Music Supervisor: Jessica Moore at Level Two Musc. Mastering: Byron Scullin at Electric Dreams Studio. 01: Ida Maria - I Eat Boys For You For Breakfast. 02: San Cisco - Awkward. 03: Gossling - Wild Love. 04: Hermitude - Speak of The Devil. 05: Hey Geronimo - Why Don't We Do Something. 07: Elizabeth Rose - Ready. 08: Angus Stone - Bird On The Buffalo. 09: Canyons - If I See You Again. 10: Daniel Ellsworth & The Great Lakes - Shoe Fits. 12: Graymercy Riffs - Little One. 13: Parallel Lions - Taste of Your Heart. 14: Clare Bowditch & Eddie Perfect - You Make Me Happy. 15: Promises - Baby It's You. 16: Euphoria - Love You Right. 17: Thao with the Get Down Stay Down - When We Swam. CD (ST)	Sony Music. 88883753032. 2013. "OFFSPRING MUSIC FROM THE HIT SHOW VOLUME FOUR". 01: The Preatures- Is This How You Feel?. 02: Lisa Mitchell - The Story of the Raven & The Mushroom Man. 03: Ellie Goulding - Anything Could Happen. 04: Gypsy & The Cat - Bloom. 05: Vydamo - Gonna Make It. 06: Jagwar Ma - The Throw. 07: High Highs - Open Season. 08: Tigertown - What Makes It Harder. 09: Phebe Starr - Alone With You. 10: Emma Louise - Freedom. 11: San Mei - Watch the Breezes. 12: The Falls - Home. 14: Hungey Kids of Hungary - Twin Cities. 15: TC & The Drop Bears - Baby Honey. 16: Mi & L'au - Up in the Building. 17: Whitley - My Heart is Not a Machine.